Cape Town — President Ramaphosa, who is in Geneva, Switzerland for the release of a report by the International Labour Organisation, urged the EU to lift whatever sanctions it may still have on the southern African nation because the nation is on the path to great reform. "We insist that this needs to be supported because Zimbabwe has turned a wonderful corner," Ramaphosa said. Ramaphosa's statement comes after violent demonstrations over a fuel price hike drove Zimbabwean President Emmerson Mnangagwa to cancel an appearance at the World Economic Forum in Davos, where he was expected to court foreign investment, and return home, EWN reports. 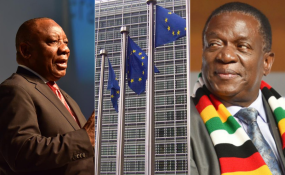 The EU and the United States imposed sanctions against Zimbabwe in 2000 after they accused former leader Robert Mugabe of human rights violations, election rigging and the repression of media freedom.